On opening the downloaded Tessera.exe file you’ll be presented with a dialog prompting you to install Tessera on your PC. Options will include installing shortcuts. The default Location is set to be the base level of your C drive rather than your Programs or Documents folder. The Tessera folder contains both the Tessera Application and the Tessera Data file. This data file is constantly being modified as you use Tessera. Windows does not expect programs to be altering in this manner which is why Tessera is placed where it is. Try the Tessera in other locations on your PC. The Documents folder should be suitable but you may experience difficulties if Tessera is placed in the Programs folder. 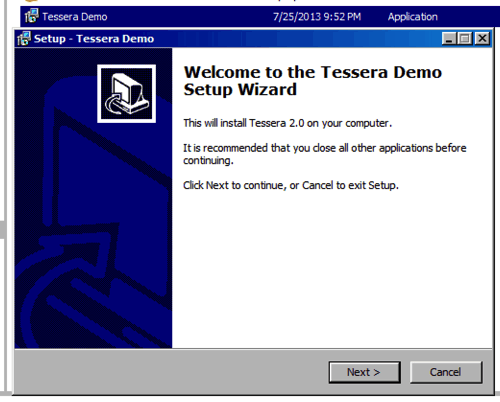 To uninstall Tessera access the uninstall feature via your Control Panel settings. If you have problems once Tessera is installed with entering data it may be that there’s a problem on the properties set for the Tessera folder. It may be set to “Read Only” which will prevent the entry of data . Open File Explorer, and then Tessera folder. Right-click the folder, click Properties, and then click the Security tab. (This step will vary depending on what version of Windows is in use). Click the Advanced button. … (This step will vary depending on what version of Windows is in use).